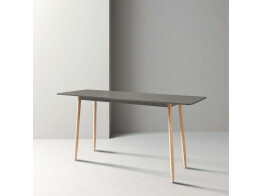 Bar Height Tables or high bench poseur tables come in a range of styles and designs from slab ended to trestle legged high tables all available in different lengths. They provide table solutions for cafe, kitchen and breakout areas. 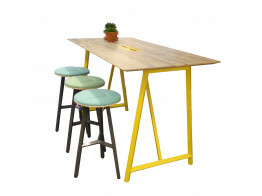 Bar height tables are also being introduced into the modern open plan office as a place for short, informal collaborative meetings, encouraging staff to break away from their workstations for a quick coffee or carry out informal meetings. Our Bar high tables can either be custom made to size or you can choose from our standard high table ranges offering mfc and veneer finished tables. 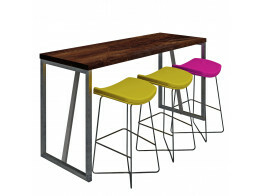 All our bar height tables have the option of adding power and data into the tops if required. 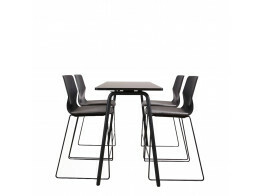 Fielding Cafe Height Tables are modern innovative poseuR tables with split table tops. The high table is an ideal solution for socializing in the coffee break areas within the office. Four®Real Poseur Table is a foldable bar height breakout or canteen table. BAE High Worktable is a solid wood collaborative informal meeting table solution. Block Raw Poseur Table is a rustic raw steel bar height table with durable top. 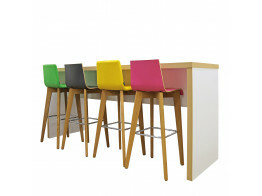 Block Colour Poseur Tables are bar height tables ideal for social interiors. Relic High Tables offer long lengths and double widths for breakout, cafe or the open office. 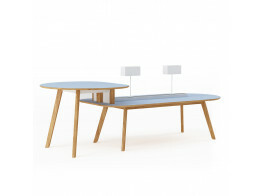 Co.Table is a shared working table solution for open plan office environments. Silta High Table is a luxurious bar height table range merging modern with vintage design.